Smith detailed metrics from his app in a blog post on Wednesday, demonstrating usage statistics of all Apple Watch models from August 2017 through to today. Of note, Apple Watch Series 3 has enjoyed steady adoption rates since its launch in September, including a dramatic spike during the holiday gift-giving season. 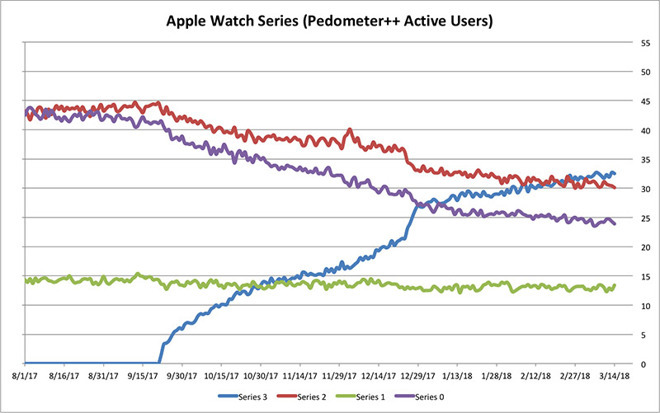 As of last week, Series 3 overtook the Series 2 to become the most popular Apple Watch model among Pedometer++ users, with the device accounting for 33 percent of Smith's active user base. The most recent data shows Series 2 sitting at about 30 percent, first-generation Apple Watch at 24 percent and Series 1 holding steady at around 14 percent. As can be expected of a new release, Apple Watch Series 3 upgraders are eating into legacy model share, with Series 2 and first-gen devices exhibiting declines that began when the most recent Apple Watch iteration debuted. Original Apple Watch devices, often referred to by the unofficial moniker "Series 0," has experienced the steepest drop off. In August of last year, usage of the first-gen wearable was roughly in line with that of its Series 2 successor, but rates have since fallen at more rapid pace. While Smith fails to provide commentary on the precipitous decline in first-gen device usage, he does say that developing for the original Apple Watch is "slow and honestly a bit painful." On the other hand, Apple Watch Series 3 with its S3 chip and LTE connectivity is a "delight to work with," Smith says. It is because of these troubles that Smith is keeping close tabs on Watch adoption. His hope is that Apple will abandon support for the first-gen device when it reveals watchOS 5, a next-generation operating system expected for unveiling at WWDC in June. "The Series 1 & Series 2 watches would be a great baseline going forward," Smith writes. "While not quite so fast as the Series 3, they are a mile ahead of the Series 0." In addition to overall adoption rates, Smith shared a few tidbits on user predilections, noting the split between 42mm and 38mm Watch versions stands at about 60/40. Further, the split between users with LTE and non-LTE Apple Watch Series 3 devices has been about even since Christmas. While Pedometer++ users are only a small subsampling of Apple Watch owners, the analytics provides general insight into owner preference. Whether Apple intends to deprecate first-gen Apple Watch models with watchOS 5 is unknown, but the company typically attempts to keep older hardware operational for as long as possible. Doing so allows owners to enjoy the latest features without upgrading on a yearly basis, fostering higher customer satisfaction and user experience ratings.